When Windows Phone 7 was release last year, along with the new Operating System and Phones came Marketplace, the on-device and now web based place for you to buy applications for your device. At the time, the pickings in Marketplace were a bit thin but that has quickly changed. 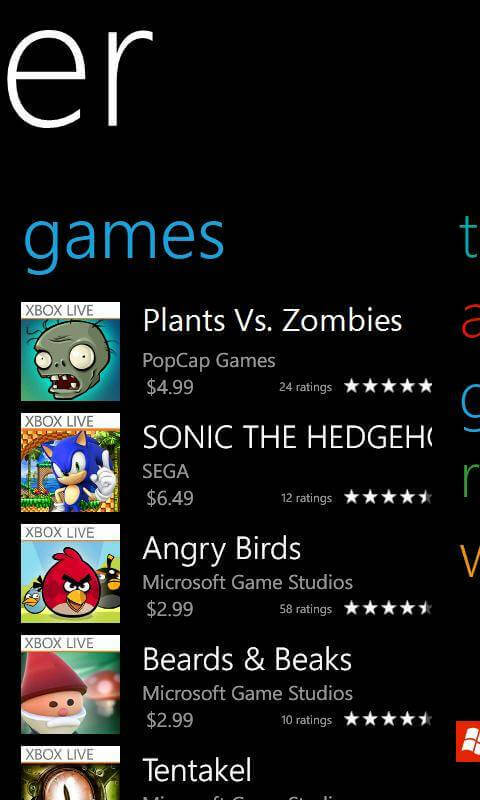 Now there are over 35,000 apps in Marketplace and Windows Phone is quickly gaining the attention of developers worldwide. One of the best apps, especially for those who are new to Windows Phone, is Insider, an app from Microsoft. Insider brings a wealth of information to users as well as new and fresh content each month. Late in October 2011 the app was updated to support Windows Phone 7.5 (Mango) with better task-switching functionality and general stability improvements. Insider provides users with five primary areas of information and content: Tips, Apps, Games, Ringtones and Wallpapers. 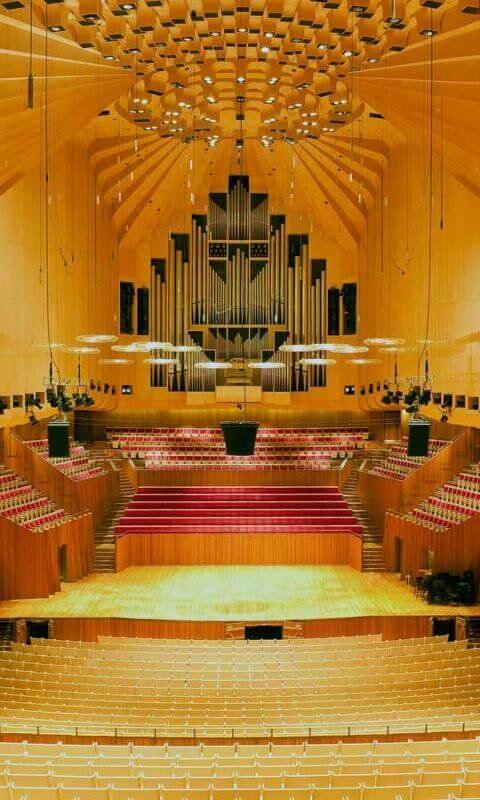 To navigate to a section of the app, slide left or right in the app or tap the name of the section you want to visit. Each of these are updated nearly on a daily basis with the notable exception being Ringtones which is updated about every month. The best part about Insider is that it along with its content are free. Insider requires about 4MB of storage on your Windows Phone and requires your device be updated to Mango. You will also need a live data connection for Insider to work. If you are, for example, in Airplane Mode, Insider will give you a warning that it could not find a data connection and will terminate. The Tips section of the app provides exactly what you would think it does: Tips and tricks on how to better improve your Windows Phone experience. Generally you will have two tips displayed with a More button at the bottom of the display to see more tips online. Admittedly, many of these tips for experienced Windows Phone users will be obvious but there are still little nuggets to be found here and there. It is clear that Microsoft has aimed this portion of the app to new users and I think they have done a good job with this section of the app. 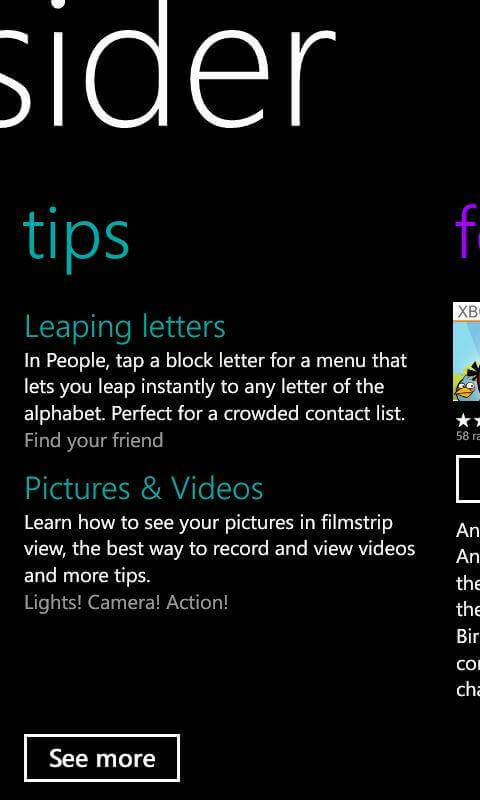 The Apps section of Insider brings you a featured app for that day. Sometimes it is an app that is on sale, sometimes it is a game, sometimes it is a free app… really, it varies constantly. In this section of the app you will have the ability not only to view the information about the app but the ability to also tap to go directly to Marketplace to try or buy the app. This section of Insider is really handy for everyone as it gives you a place to discover apps you may not know about without having to dive into the Marketplace itself. 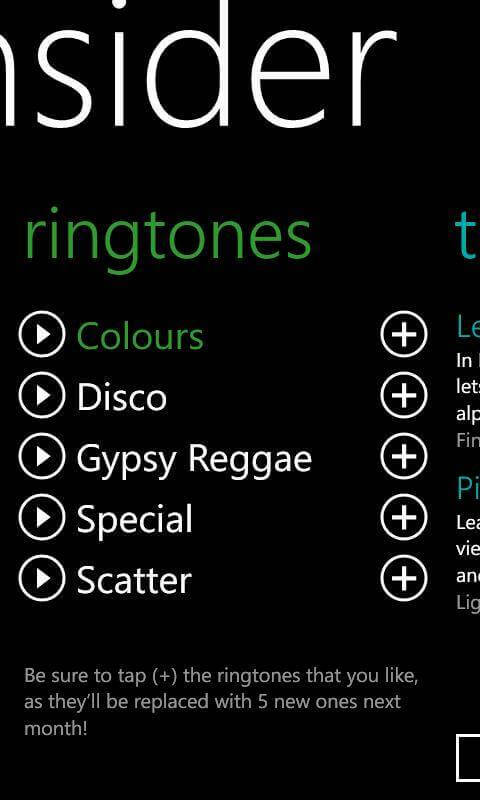 Ringtones gives Windows Phone users five different ringtones that they can listen to and download directly within the Insider app. The ringtones are updated about once per month and usually follow a theme of some sort. For example, many of the ones in October were Halloween themes – creepy sounding ringtones. 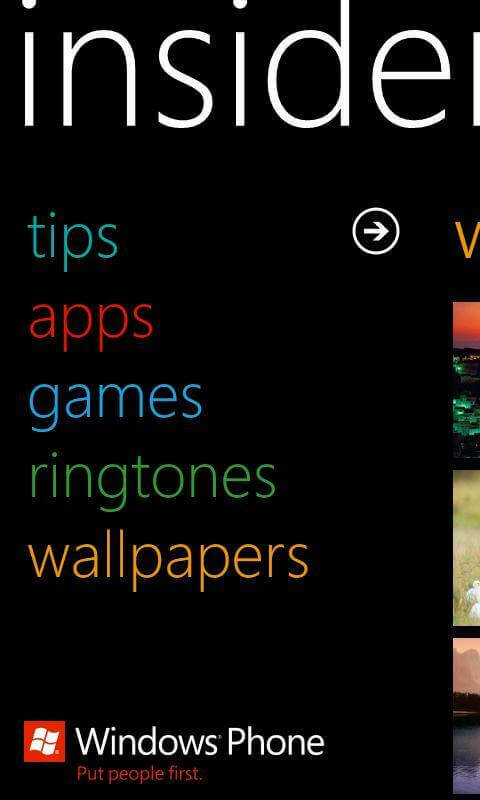 To listen to a ringtone, tap the play button next to the name and it will stream to your Windows Phone. If you like it, tap the plus button and it will be downloaded to your device. It’s that quick and easy and best of all free. The final section of the insider app is Wallpapers. Like Ringtones, these are free to download directly from the Insider app but it is updated daily. Why? 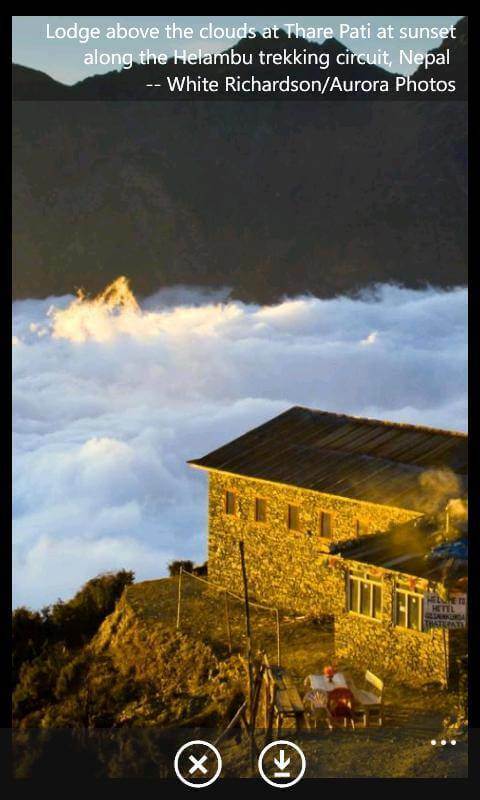 Because it is providing you Windows Phone sized versions of the daily wallpaper found on Bing. For those who do not use Bing as your search engine, you should absolutely check it out. 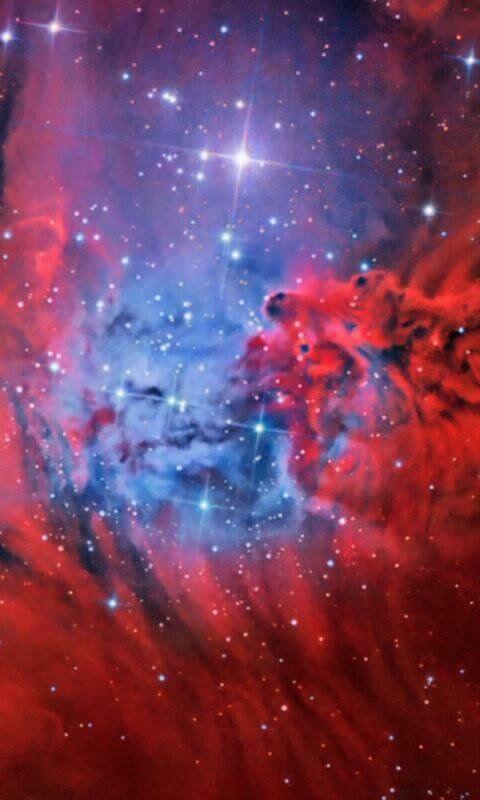 Bing updates its wallpaper each day and some of them are simply stunning. 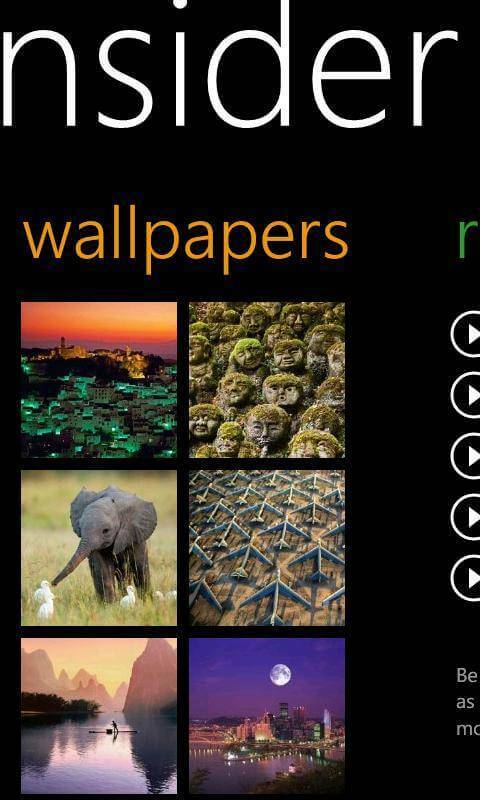 With Insider, usually the day after a wallpaper is displayed on Bing, it is available in the app. You can then tap it, then tap the more information button (…) and download it to your Windows Phone. As a general rule you can usually expect the last week of Bing wallpapers to be in Insider. That means if there is one you really like you need to make sure to visit the app and download it to your phone. Overall it is hard not to like the Insider app. It has plenty of great tidbits of information, great content and it is free. 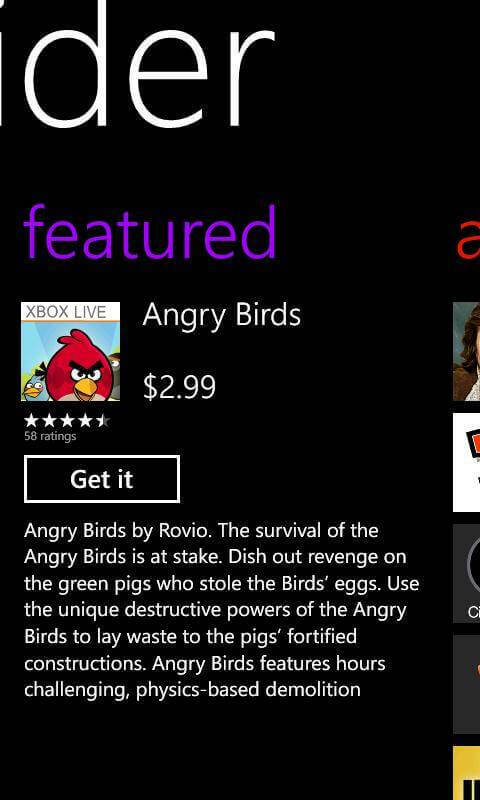 You can download Insider from Marketplace from the web or your Windows Phone.